December is not usually a big month for bird news. But this year has been different. 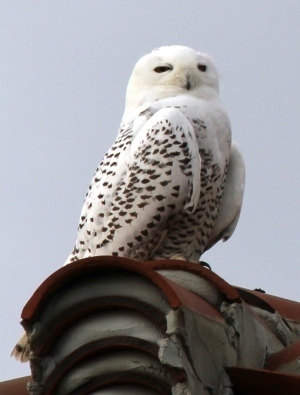 First in the headlines, a snowy owl showed up on Sea Island. From 1930 to 2001, as few as five of these beautiful Arctic raptors have been documented in Georgia, and only one other along the coast. The owl caused a stir among birders – about 250 flocked to the private resort island to see it – before moving to adjacent St. Simons Island, where admirers were photographing it this week. Tim Keyes, a wildlife biologist on the coast with Georgia DNR’s Nongame Conservation Section, said most snowy owls that show up far south are young males pushed by dwindling food resources in the north and adult birds defending their feeding territories. Many of the transplants are malnourished, and often die from a fungal infection called aspergillosis. Keyes said one pellet from this bird included mostly songbird bones. But judging by the direction the snowy owl has been flying each afternoon recently, it may be targeting prey more common for the species: gulls, terns and other shorebirds. DNR rangers along the coast recently captured one ailing bald eagle in a Savannah neighborhood, and began investigating another adult bird found dead in rural Bryan County. Ranger Jason Miller retrieved the dead bird Nov. 28 after a hunting club member spotted it on leased land in the Waterford Landing/Belfast River Road area. The eagle had no visible injuries, Miller said. An x-ray by the Georgia Sea Turtle Center on Jekyll Island did not reveal any pellets or bullet fragments, according to Tim Keyes. A full necropsy might be done. Further details were not available, and the case is under investigation. Eagles are protected by state and federal laws. The Nov. 30 call from a homeowner in a south Savannah subdivision had a brighter ending. Ranger Kate Hargrove and Cpl. Chris Moore arrived to find a bald eagle that couldn’t fly but could walk and hop. They herded the bird into a cage – “Probably the easiest eagle grab I’ve ever done,” said Hargrove – then took it to where Hargrove used to work: The Center for Birds of Prey, part of the Avian Conservation Center near Charleston, S.C. The center’s medical clinic director, Debbie Mauney, wrote in an email that the eagle had deep puncture wounds from conflict with another bird, likely another eagle. Yet there were no fractures, and Mauney is hopeful the eagle will recover, a process that will probably take several weeks. The bird would then be released back into the wild at a site to be determined, Mauney wrote. North America only nesting stork is recovering, too. This week, the U.S. Fish and Wildlife Service proposed upgrading the Endangered Species Act status of wood storks breeding in the U.S. from endangered to threatened. The proposal follows a comprehensive review and reflects growing numbers of nesting wood stork pairs, plus expansion in the big bird’s breeding range. 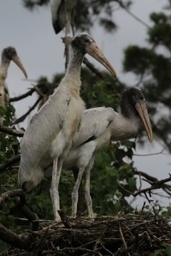 Three-year averages over the last 10 years ranged from 7,086 to 8,996 nesting pairs, topping the 6,000 benchmark average to reclassify wood storks but shy of the five-year average of 10,000 pairs targeted for delisting, according to the Fish and Wildlife Service. DNR’s Nongame Conservation Section documented 1,903 wood stork nests in 17 colonies in Georgia this year, down from 2011 as drought derailed some typically large colonies from establishing. Wood storks have been nesting here in generally increasing numbers since the 1980s. Also, through public and private partnerships with the Natural Resources Conservation Service’s Wetlands Reserve Program, nearly 20,000 acres of key wetlands in Georgia have been restored or managed to benefit wood storks and other wildlife. The program has restored more than 315,000 acres of wetlands in Florida, Alabama, South Carolina and this state during the past 18 years, according to the Fish and Wildlife Service. Freshwater wetlands are crucial for wood stork rookeries and feeding areas. The proposed reclassification, spurred by a petition from groups representing the Florida Home Builders Association, will not change conservation or protection measures for the species. The public can comment for 60 days after the proposal is published in the Federal Register. The wood stork was federally listed as endangered in 1984. The tradition of sending Christmas cards is said to have begun in England in 1843, with cards being printed in the U.S. as early as the 1870s. Since, Christmas cards have been graced with a veritable flock of birds. But there is one bird that has been on more cards than all others – the northern cardinal. More than likely, the color is key. The male cardinal's crimson red matches the robes worn by many members of the Catholic Church's College of Cardinals. Of course, red is also one of the most common Christmas colors, including Santa's suit and holly berries. For more than a century, cardinals have been expanding their range northward? It's not too early to begin the behavior changes that cardinals will undergo from winter through breeding season, including a fascinating practice called countersinging? 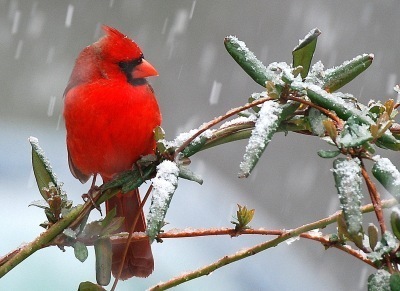 A few simple things can transform your yard into a haven for cardinals? Find the answers and more about the Christmas card bird in Terry’s complete “Out my backdoor” column. Terry W. Johnson is a former Nongame program manager with the Wildlife Resources Division and executive director of TERN, the Nongame Conservation Section’s friends group. His columns are archived here. Editor's note: Georgia Wild will be issued once a month in December, January and February, because of the holidays and the annual nongame fundraiser Weekend for Wildlife. The e-newsletter will return to twice-a-month production in March. Georgia volunteers with an interest in frogs and keen ear for their calls are needed for the 2013 North American Amphibian Monitoring Program. Participants must pass an online quiz and commit to running a pre-set route three times a year. Surveys start Jan. 15. Contact Nongame Conservation Section's John Jensen for details. The 2013 Give Wildlife a Chance Poster Contest is open for entries! Entry forms and guidelines for K through fifth-grade students and teachers are available here. Deadline to enter is March 27. 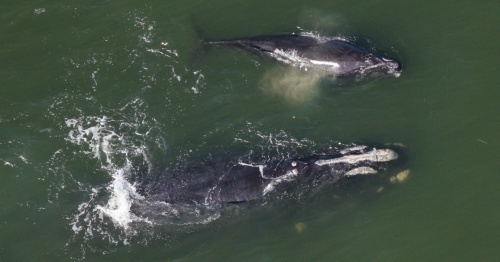 The number of North Atlantic right whale mothers and calves showing up off Georgia is going up. As of mid-month, nine mom/calf pairs had been spotted – the first off Hilton Head, S.C., on Nov. 27, and then off Mayport, Fla., on Dec. 4 (pictured below) – plus five potential mothers, or females at least 6 years old. Georgia aerial and boat surveys of the migrating whales began this month and will continue through March. See more photos on our Flickr site. 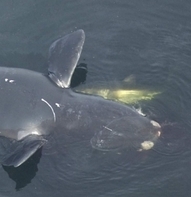 A right whale report card estimates the 2011 population of this highly endangered whale at 509. Download a copy of the 2012 report by the North Atlantic Right Whale Consortium, or the consortium’s latest Right Whale News issue. A red-tailed hawk shot and killed at a Rockmart park in late November led to a successful stake-out by DNR Cpl. Wil Smith. Following up on information received by Ranger 1st Class Chad Cox, Smith found the dead hawk, determined it had been killed with a shotgun and, believing the shooter would return, watched the area for eight hours – until the suspect showed up. He has been charged with killing a protected species and discharging a firearm in the city limits. Sprewell Bluff, a former state park along the Flint River, will be managed by Upson County, though DNR’s Wildlife Resources Division will still own the property. With county handling day-to-day operations, the 50-year agreement that took effect this month will keep the middle Georgia site open to public recreation – including hunting – with DNR continuing to help manage the habitat. Another 35 people were trained as wildlife firefighters in a recent course led by Wildlife Resources Division staff. Trainees learned about everything from radio use to tool maintenance, and ended the two-day session with a live fire exercise involving their first controlled burn. The bald eagle nest at Berry College is in the public eye. A video feed from a pole-mounted network camera set a safe distance away is focused on the nest. Georgia Wild is free, sent twice monthly and focused on rare, endangered and other nongame wildlife. Nongame includes wildlife not legally fished for or hunted, plus native plants and natural habitats.